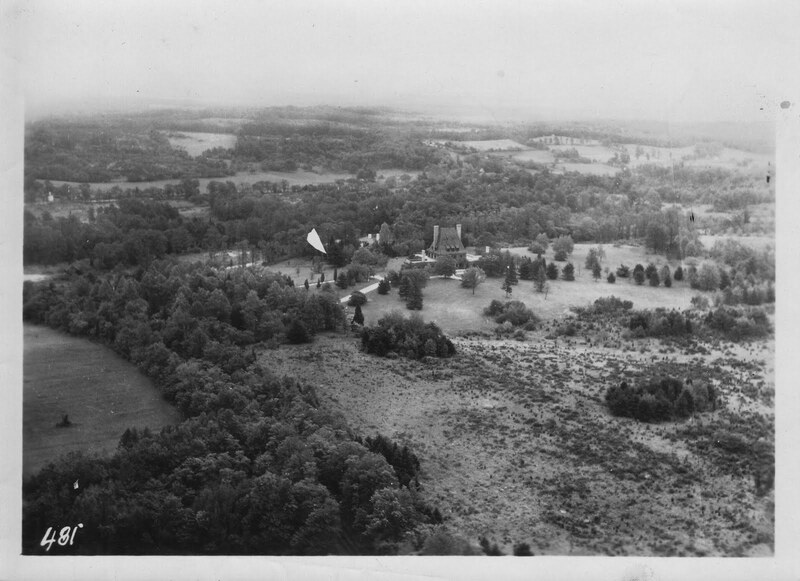 An aerial of 'Chateau Ivor', the Charles A. Gould estate designed by John Russell Pope c. 1908 in Dix Hills. Click HERE for more on 'Chateau Ivor' and HERE to see the brochure from when the estate was for sale. Photo from the Gould family collection. Odd question perhaps - whats the soil like in this area? In the open areas it appears low growing plants are scrubby and the soil looks to be sandy and dry. Look at all that open land. Who'd ever have dreamed that only 75 years later it would be cheek to jowl with houses? Amazing how bucolic Long Island was not so many years ago. And HPHS raises an interesting question: Typically, the soil in this part of Long Island is fairly loamy and lends itself well to agriculture- both farming and gardening. The foreground of the photograph is interesting as I agree that it appears far more akin to the sandy conditions found further south, towards the Atlantic and Great South Bay. I think it's just a large, untended section of lawn. Check out this piece of land that is part of Old Westbury Gardens...has a very similar appearance and I know that it is just overgrown. I can't stop coming back to gaze at this photo..so beautiful. Are those two pillar shapes behind the house the main gate? I believe those are the chimneys of the carriage house/garage that sat behind the house. LOL...I didn't see a roof until you said that. One can theoretically trace this idea of a a central pavilion and high roof in French Manor style, with flanking pavilions, from the Jennings house at Cold Spring Harbor to Chateau Ivor to the King house, as a straight line in progression of taste and design. This is a mesmerizing picture. DED - great link,Frederick R. King is more impressive daily. Who was Frederick Allen? I thought this was a Prince family home although that may have been later. Chip, correct, the Prince family bought the house much later. And the point of Pope's exercise here at Dix Hills L.I.? The Gould commission pays tribute to an extreme academic eclecticism as was, albeit rarely, practiced in his day. So we see the noblest extraient of château featuring low, low extrusions. Arrival of the French shooting box, petite multipurpose wings laid out. Amusements taking shape in a dozen ways; Panoramic views of 100 miles on sunny days from way up above - Otherwise, forces of restraint notwithstanding, creativity, imagination, and spirit obtrude obliquely from the nether regions further below. One thinks that less orthodox forms are not likely required.